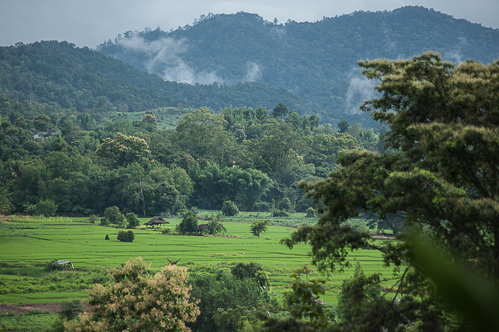 Amphoe Pai is a small district in Mae Hong Son province. Located about 3 hours drive from Mae Hong Son City or 3.5 hours from Chiang Mai, via very scenic routes. 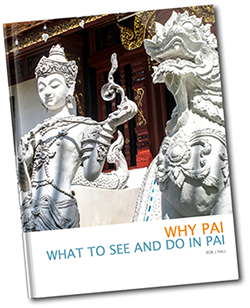 Pai is well known for its natural beauty and for the cohabitation of various hill tribes and travellers of all origins. A favourite among both local and expat resident communities for its cool climate and easy going lifestyle, Pai has become a must-see destination for visitors to the North of Thailand. Wat Klang Location: Pai centre, near bus-station. Wat Klang is in Tambon Wiang Tai. In the precincts of this temple, a main Chedi of Thai Yai style stands in the center of the temple yard. It is surrounded by Mon Chedies, below which Buddha images of the seven days the a week can be seen in niches. A finial-topped Mandapa was built on the base of the main Chedi. Wat Toong Pong Location: Approximately 3 km south of Pai. Admire the intricate, Burmese-style Buddha statues. The only examples in Pai. Pam Bok Waterfall Location: Approximately 12 km south of Pai. The turn off is approximately 8 km from Pai on the right, before Pai Canyon. Nice, secluded waterfall with a high ravine surrounding it, making this a cool place to escape the heat. Go for a relaxing bathe in the shade during the dry season. Pai Canyon (Kong Lan) Location: Approximately 8 km south of Pai. Optimistically described as Pai’s answer to the Grand Canyon, Pai Canyon has narrow red ridges with steep-sided valleys, both sides filled with pine and dipterocarp forests. The steep 50 m drop either side and stunning views over the surrounding countryside are impressive, but you’ll need to be careful here. The path is extremely narrow in some places and requires a scramble in others. A set of steps up to a viewing platform provides the safest way to admire the scenery and the canyon makes the perfect spot for a sunset. Tha Pai World War II Memorial Bridge Location: Approximately 9 km south of Pai The Tha Pai World War II Memorial Bridge was built in 1942 by the Japanese when they needed a transportation route for troops, provisions and weapons from Chiang Mai to Myanmar. It is of similar stature to its more famous counterpart, The River Kwai Bridge in Kanchanaburi province. The World War II Memorial Bridge remained in daily use, after the war, until its deterioration prevented people from crossing it. At this point the new concrete bridge was built next to the original bridge. The Memorial Bridge was restored in 1976. Tha Pai Hot Springs Location: Approximately 11 km south of Pai. This attraction is part of Huai Nam Dang National Park. The hot springs are 2 km off Route 1095 at Km. 87, the entrance fee for foreigners is THB 200. Tha Pai Hot Springs (continued) The springs have an average temperature of 80°C. Steam from the springs permeates the site in the morning creating fascinating sights. The area is also rich in teakwood and suitable for overnight camping. There are also hot springs located in Amphoe Pai area, named Muang Paeng Hot Spring in Tambon Muang Paeng, Pong Ron Hot Spring in Tambon Mae Hi and Pong Duat Hot Spring in Tambon Tung yao. Shandicun Chinese Village Location: Approximately 4 km north-west of Pai. The village was founded by Chinese nationalst soldiers. It is now home to approximately 2’000 Yunnan Chinese refugees. The tourist area supports the village by selling locally grown oolong tea, candied fruits and souvenirs. The surrounding restaurants serve traditional Yunnan food. Mo Paeng Waterfall Location: Approximately 9 km north-west of Pai. The waterfall is easily reached by car, motorcycle or bicycle. The surrounding area is shady and beautiful. The Rocks that the water flows down, have been worn smooth. Watch the locals use them as a water slide and copy them. 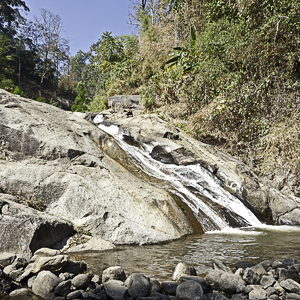 Nearby there is Muang Soi Waterfall and a peaceful Muser tribe village. Wat Sridonchai Location: Approximately 3.0 km north-east of Pai. At 700 years, the oldest remaining Wat in Pai. The small Buddha statue inside is reputed to be 800 years old. Wat Phra Buddhabaht Location: Approximately 4.5 km north-east of Pai. Also known as Wat Buddha’s Footprint. A tiny, inconspicuous temple, important to the locals for an impression of Buddha’s footprint imprinted in the rock. Secret Hot springs Location: Approximately 12 km north of Pai. Follow Highway 1095 towards Mae Hong Son. After approx 12 km (one kilometre after the sign for the national park) a road turns off to the right. (Exactly 10 km from Amy’s) Pay 20 Baht at the toll booth at the turn-off and follow the road into the jungle for approx 4 km. Watch the trees for green signs, the springs are on the right .